Are there any standard techniques for comparing signatures to determine the likelihood that they are or are not by the same person? "... detailed microscopic comparative examinations are made of a set of known ("specimen") signatures and one or more questioned signatures, the writer of which is in doubt." Those techniques would not be applicable in this case. 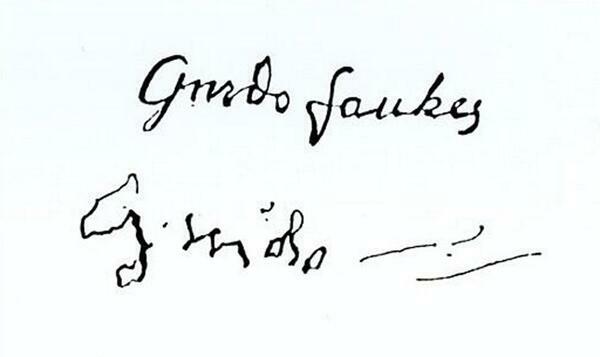 Here we have only one specimen signature, and the pair are separated by half-a-lifetime! While there is nothing to suggest anything so extreme in Daniels case, it must be noted that we know nothing of changes in Daniels health over he intervening 42 years. To give just one example, osteo- or rheumatoid-arthritis in his hands might have made it more difficult to hold a pen (in modern populations, between 10% and 20% of adults exhibit symptomatic osteo-arthritis by age 60. The percentage increases with age). Conditions like these, which have a gradual onset, would have resulted in changes in his writing style, and so also to his signature. As a result, none of the standard techniques for comparing signatures are really appropriate in this case. You would need (preferably multiple) examples of his signature from the intervening period in order to make a meaningful comparison between them. Not the answer you're looking for? Browse other questions tagged palaeography probate-records new-jersey or ask your own question. Where to find Will of Giles Chichester from 1820s, probably in Somerset or Guyana? What are these words in the 1841 will of Elisha Strong? What are the dates on these documents? Who are the Campbells in this document? What are these abbreviations in Wills and Administrations of Isle of Wight, Virginia?